We want to extend many thanks to Akutsu Gallery for making this special occasion possible. 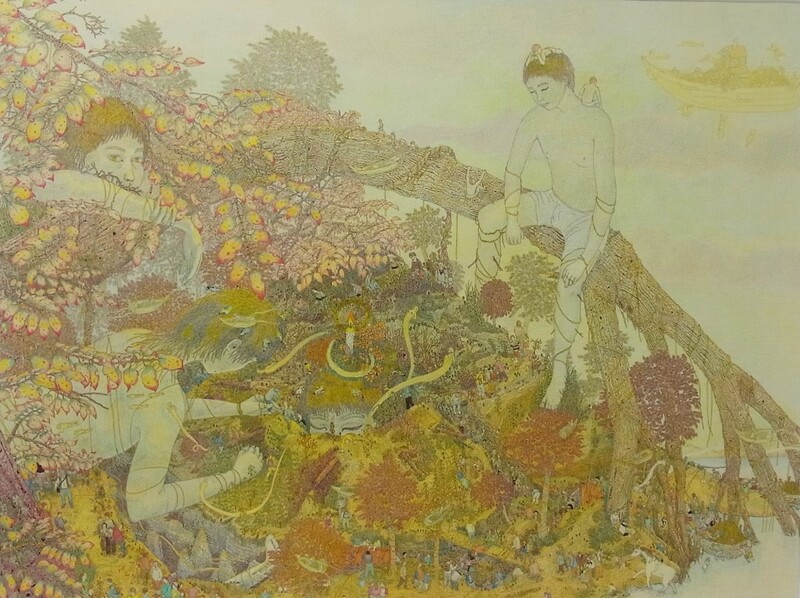 Tadashi Tanaka’s work “耳を澄ませば” (“If you listen carefully”, 91 x 122 cm ). Close-up of “耳を澄ませば” (“If you listen carefully”) . 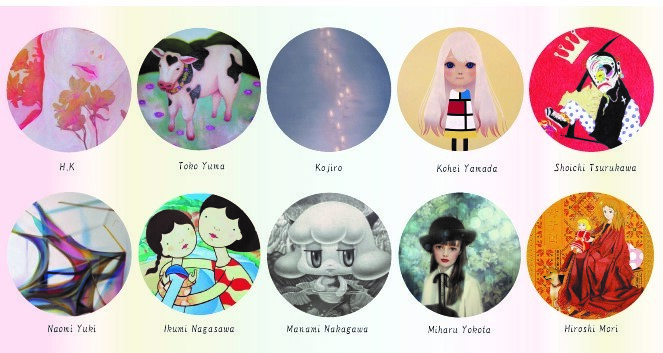 In 2015, Tadashi Tanaka’s work “Welcome home” has been chosen as ART OLYMPIA 2015’s top prize winner. His work has been selected out of 4186 artworks from over 52 countries. The first selection took place in Tokyo, New York, and Paris. Then, 236 works remained. The last selection took place in Tokyo. This last selection was broadcasted live by many news sources, including “You Stream” and “YouTube”. His prized work, “Welcome home”, also won the special prize from Kara Vander, gallerist of the Gagosian Gallery. We invite you to come experience the peculiar feeling and warmth of his landscapes. We are sure you will be delighted by his graphic works. Tadashi Tanaka successfully weaves a rustic world of fantasy with the fine lines of a black ball-point pen and the delicate shades of color pencils. 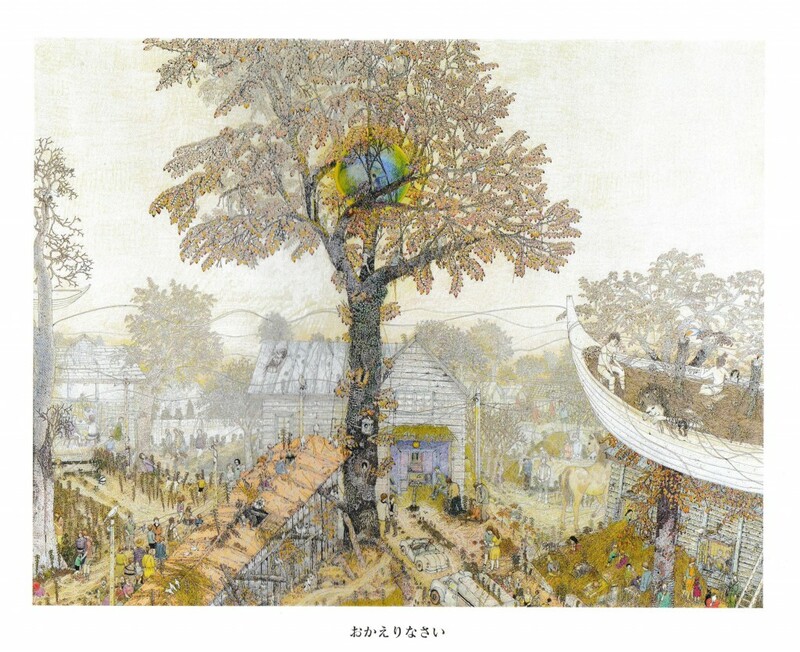 His works might remind us of the landscape of a village in Northern Thailand, where the local deities hover over rice fields dotted with stilt houses, guiding a flying boat. When a wandering naked giant god goes to sleep, his peacefulness resembles Buddha’s nirvana. The artist, Tadashi Tanaka, is a stubborn warrior. After quitting school at fifteen, he found his art teachers in local artists or in masters in the past or remote places, thereby changing his own styles from time to time. Tanaka became a painter; however he earned a living not by painting pictures but by working on walls and boards with carpenters. In 2015, at the age of 62, the painter was awarded the top Golden Prize at the 1st Art Olympia and received a hefty $120,000. The competition was fair to everyone as it overlooked the educational background or artistic career of the participants. The jury was international, composed of experts from several countries. Incidentally, the Second Prize was given to a Portuguese artist, the Third to a Taiwanese. A few people were surprised by the fact that the unknown Tadashi Tanaka got the big prize, him who had hardly engaged with nationwide art organizations or competitions. The Art Olympia appreciated Tanaka’s expertise as it was, while he never concerned himself with artistic authorities nor followed the trends. Looking back, we see contemporary artists having tried out every kind of method or style and being unable to find a new motif. Ethnic themes could be a breakthrough, but if you absent-mindedly rely on all things ethnic, your work may perhaps end up in a souvenir shop for tourists. The artists should find out the center of balance for truly free expression. 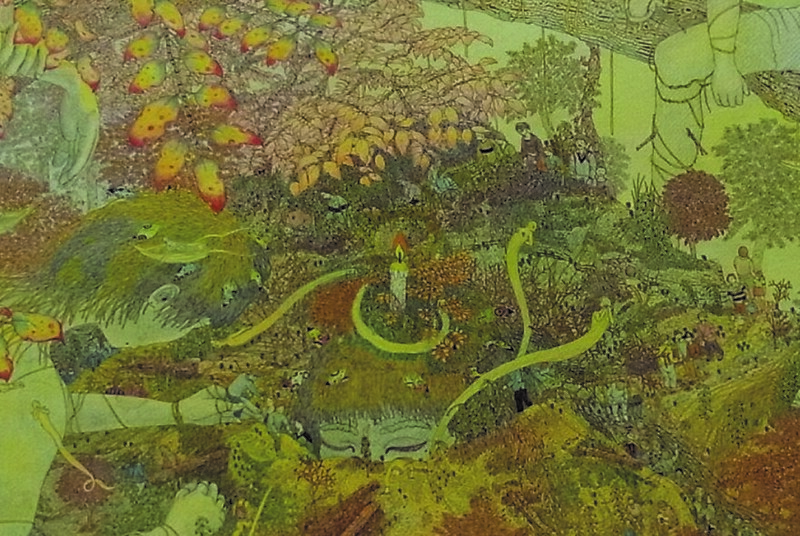 Tadashi Tanaka himself may not admit any relationship with things in Northern Thailand as was suggested here in the beginning; he would probably maintain that it is the forest spirits of his home country of Gunma that hover around in his artworks. His large artworks are a kind of mandala made with the intricacy of a miniature, while his smaller works can be combined to resemble a lovely picture book. The stubborn warrior has woven, steadily and intricately, landscapes of an unknown civilization. Tadashi Tanaka prized work: “Welcome home”. 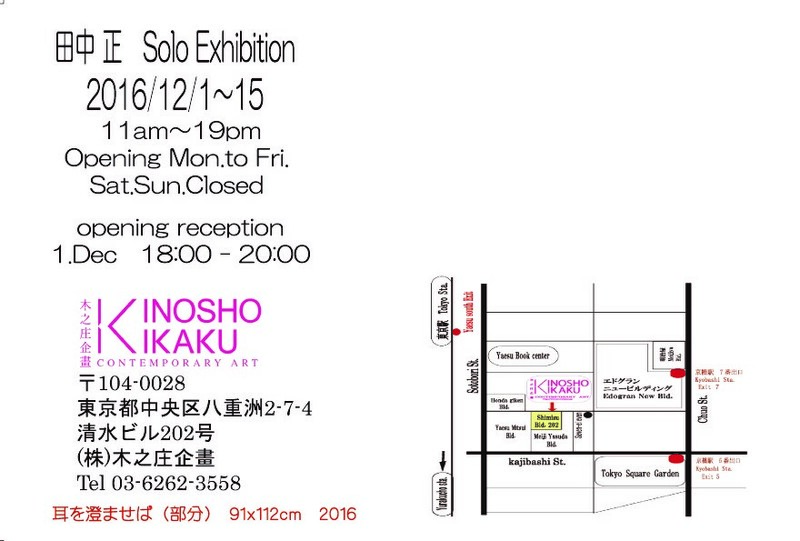 Exhibition period: From December 1st through December 15th, 2016. Opening hours: 11am to 19pm. Opening reception: December 1st, from 6pm to 8pm. 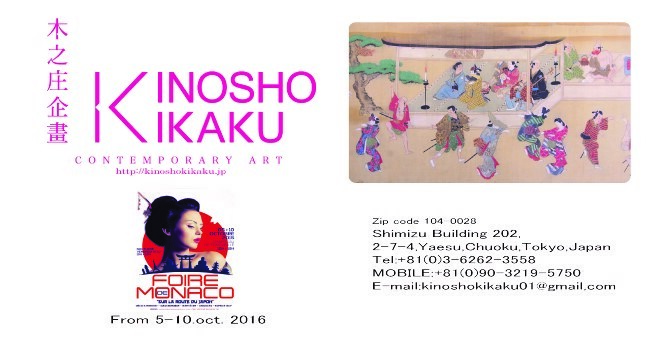 KINOSHO KIKAKU gallery will be at the Monaco Fair ! 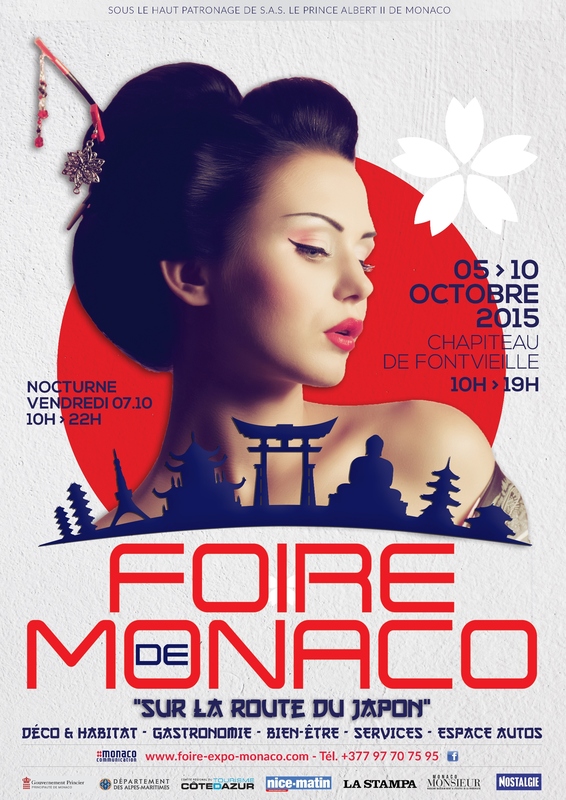 We are proud to share with you the exciting news of our participation at the “Monaco Fair”, from October, 5th to 10th, in Monaco, France. This year, the theme of the Fair being “Japan”, it is a perfect chance for us to bring contemporary Japanese art to the French public and facilitate access to these high quality works for art collectors. We will also display traditional Japanese art works, thus mixing modern and ancient, in a typical Japanese way. For the first time, the Fair will be inaugurated by HSH Prince Albert II, on October, 5th, and we hope many of you will come to discover our art works. See you soon in Monaco !